The first box was again a total remake from the previous versions. It was designed to match the style of the popular “dancing silhouettes” commercial. The clamshell box was black on the outside and all white on the inside. The interior was made up of pressed cardboard, which made a pretty cheap impression and was not like Apple at all. On the right inside cover flap it was printed “Designed by Apple in California” with Myriad font in a subtile gray color. The envelope with documents and the CD was white. The remote, case with belt clip and soft pouch was not included, but the 40GB model had the dock. The case and the remote could be bought separately for $39 each. The U2 Special Edition had a totally different sleeve than the regular edition. It was black and white with a sharp red field around the “U2”. The interior was exactly the same as the regular version. The envelope had some special U2 offerings and a collector poster of the band as well as the usual stuff. 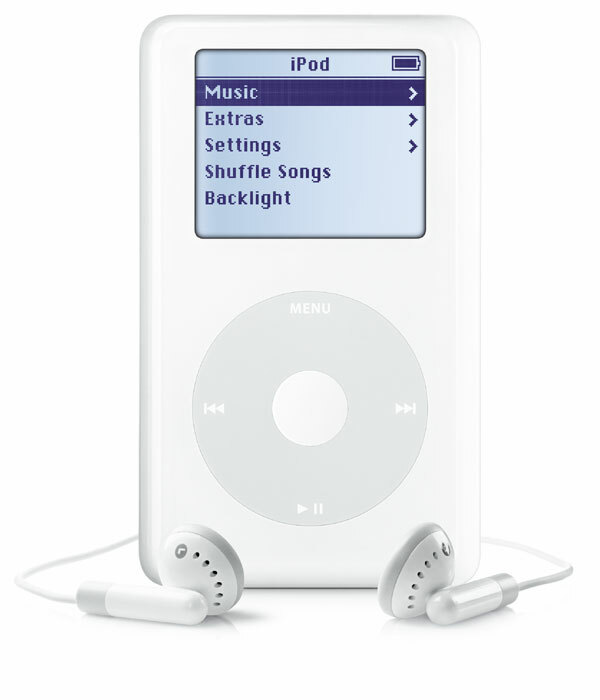 The iPod had the same specifications as the regular iPod, but the outside was designed in a different color scheme. The front was hight gloss black with a sharp red click wheel and the band members signatures were etched to the polished steel back side of the iPod. The boxes were redesigned to emphasize the photo capabilities. The LCD screen was a two inch diagonal LED backlit display with a 220 x 176 pixel resolution and 65,536 colors. It was shipped with all accessories and an additional A/V cable. 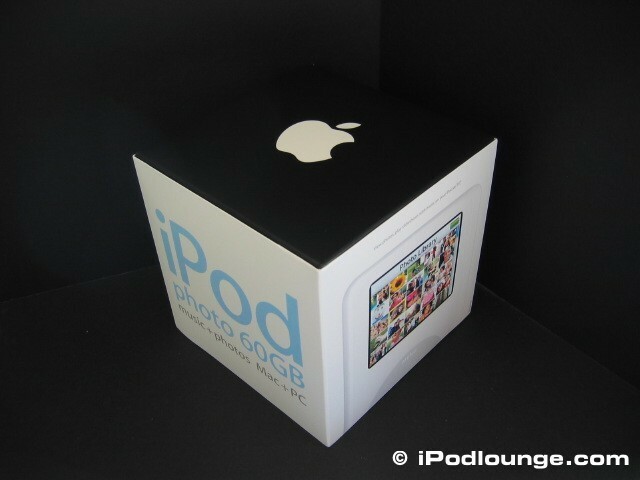 When the 30GB iPod photo was released with the new small form factor box, the original fourth generation iPod was also shipped in the new box. The boxes went through a major revision for this version. They were totally redesigned. The box was smaller and the sleeve was different. The way the box was opened was also totally different. This version of the iPod was released with the new smaller box. The inside of this box is explained below in the U2 Special Edition version. Inside the box the iPod sits in a recessed slot to the right. Both halves of the inner box contains the accessories. The boxes opens up at the top to access the inside and pull out the goodies. To the left you find the AC adapter and the earbuds. To the right there are the documents, CD and the USB cable. This time around Apple skipped the FireWire cable, A/V cable, dock and the case. The fourth generation iPod was also released and sold by Hewlett-Packard in August 2004. They had different HP sleeves, special HP documentation and software-CD and the HP-logo etched to the backside. The Harry Potter Special Edition iPod became available for a limited time online September 7 2005 and had Hogwarts Crest etched on the backside. 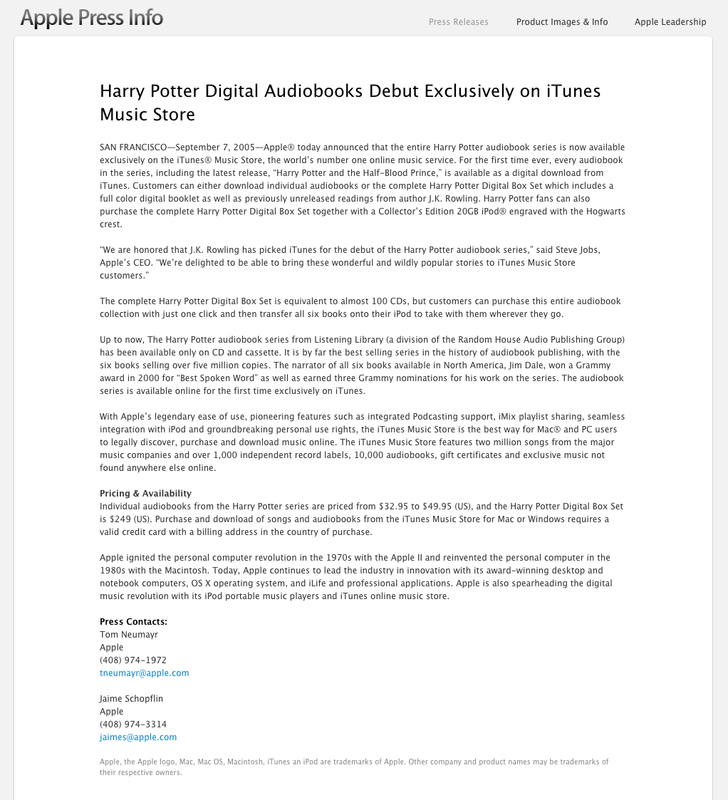 It was released to celebrate that the “entire” Harry Potter audiobook series was introduced exclusively on iTunes Music Store. The Harry Potter Special Edition iPod was priced at $299. It was shipped in the same box as the iPod color, the small form factor box. It was possible for customers to download individual books, but the whole set was $249 and included a digital booklet and some unpublished readings from the author J.K.Rowling. Reading was the male voice actor Jim Dale. 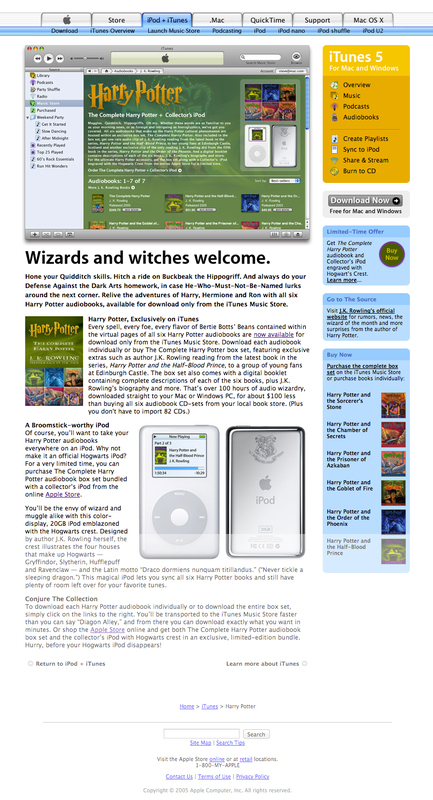 The iPod was also available as a special bundle with all the audiobooks. This entry was posted in 4th Gen by Martin. Bookmark the permalink.